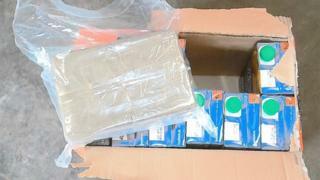 An organised crime gang has been jailed for smuggling cannabis into Northern Ireland in crates of orange juice. Two men were observed packing 167kg of cannabis resin into a van in Camlough, County Armagh, in April 2015. The drugs, with a potential street value of £800,000, had been hidden among orange juice cartons in pallets imported from Spain via Dublin. Mark Fleetwood, 53, of Dingle Side, Hall Green, Birmingham and Paul Green, 63, of Weatherfield Road, Tyseley, Birmingham, were sentenced to two years and four months, half in custody, half on licence, at Newry Crown Court. They had admitted importing a Class B drug and possession of a Class B drug with intent to supply. The group's fixer, Stephen Dainty, 54, of Pool Farm Road, Acocks Green, Birmingham, received the same sentence for importing a Class B drug. The court heard that over a period of two months, Dainty rented a unit in a retail park, organised logistics around the consignment, and arranged for Fleetwood and Green to travel from Birmingham to Newry to take delivery of the drugs and facilitate their onward distribution. Following their arrests, NCA officers searched Dainty's home and found documents relating to the orange juice delivery. They were able to place the three together on flights between Birmingham and Dublin by analysing telephone and computer communications. Rob Burgess of the NCA said: "We caught Mark Fleetwood and Paul Green with a substantial amount of cannabis resin which, if sold on, would have generated significant cash to potentially fund more criminality. "We are grateful for the support of PSNI in disrupting the group's activities and ensuring the drugs did not make it to the streets of Northern Ireland. "The NCA will continue to work in partnership to protect Northern Ireland from criminals who try to exploit borders and bring them to justice."